The Hulk and the Absorbing Man, two nigh unstoppable foes, go toe-to-toe in The Immortal Hulk #10, written by Al Ewing, with pencils by Joe Bennett, inks by Ruy Jose, Le Beau Underwood, and Rafael Fonteriz, and colors by Paul Mounts. Previously, the secret government agency, Shadowbase, sent a souped-up Absorbing Man (aka Carl Creel) to hunt down the fugitive Hulk after he escaped one of their facilities. 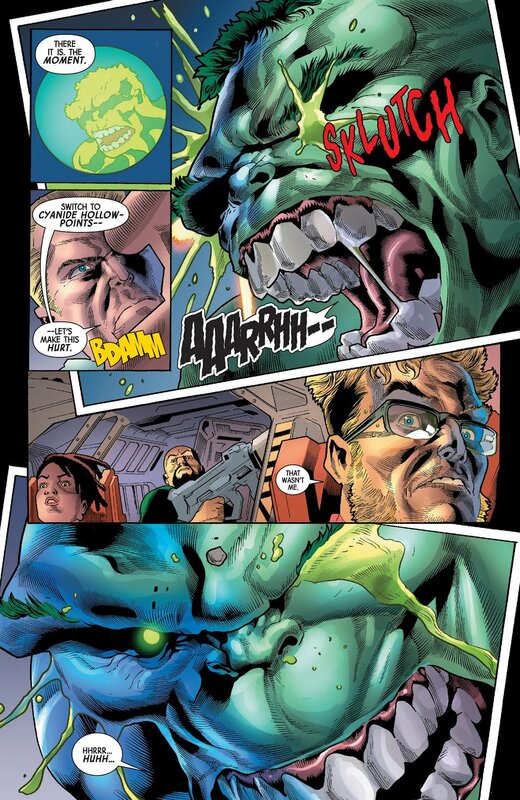 In the battle that followed, Creel absorbed the supernatural entity that had taken up residence inside the Hulk, along with most of his Gamma radiation. Upon realizing something had gone horribly wrong, Carl’s body was split down the middle, leaving his skull and spine exposed. Not disturbing enough for you? He’s still standing, muttering over and over again how sorry he is. Now, Shadowbase has sent a super-powered sniper to make sure Hulk doesn’t get away, and Walter Langowski’s Gamma Flight is on their way to bring Banner in, themselves. Ewing continues to craft an unsettling, and always-shocking tale this issue. All of the elements of a classic Hulk story are present, with the addition of some very welcome horror elements, as well. Old Jade Jaws has always been called a monster, but seldom have readers found him, or his book, to be truly terrifying. There have been smart Hulks, cunning Hulks, devious Hulks, and straight-up evil Hulks, but this iteration is bone chilling in his approach to violence. When he smiles, you know he is enjoying the pain he is dishing out. This issue, alone, has him use the skull and spine of the Absorbing Man as a weapon against the frightful, split body of Creel. In addition to his disturbing outward demeanor, the readers are never really privy to what this Hulk wants. He seems content to show up at night, and hurt whoever Banner wants him to hurt, as if that’s enough to keep him happy. Considering he recently murdered someone--something that even scared Banner upon his discovery of it--could there be even more malicious deeds in his future? This issue also heavily features two of Ewing’s additions to Hulk’s supporting cast--Jackie McGee and Walter Langowski. Walter has always been in Banner’s circle to varying degrees, as they are ex-college roommates, and both super strong, Gamma-powered superheroes. Langowski recently lost his ability to turn into Sasquatch when Hulk absorbed all of his Gamma radiation, but that hasn’t kept him from forming Gamma Flight, a team devoted to bringing Banner in as peacefully as possible. McGee, on the other hand, started off as a journalist on the trail of the Hulk, and has somehow gotten herself involved with the super-powered people trying to bring him to justice. Does Ewing have a clear plan for this character? It’s hard to say at this point. She seems to be just bouncing around, falling head first into the next adventure, but that could all be by Ewing’s design, as she tumbles deeper and deeper into Hulk’s world. Bennett, as always, provides superior pencils for the Hulk. Even when drawing the Gamma deficient, emaciated Hulk, with all of his loose skin, he still manages to make him look cool. Not to mention his creepy Absorbing Man, stumbling around, while torn in two. May this book never lose Joe Bennett, because they might as well shut it down if it did. Jose gets some help on inks this issue, with Underwood and Fonteriz seamlessly mixing in. One can only assume Jose was pressed for time on a deadline, because he normally does great work. The same can be said for Mounts, whose bright greens and dark hues always elevate this book to the next level of horror. Never let this art team leave this book, Marvel. Chain them to their desks, if need be. In the end, this is yet another spectacular issue of Ewing’s run on the Hulk. Excitement, terror, great character work, and instant-classic storytelling: these are all things Ewing brings to this book on a monthly basis. And this issue even has a big reveal about the hidden big-bad’s motivations with its cliffhanger ending.